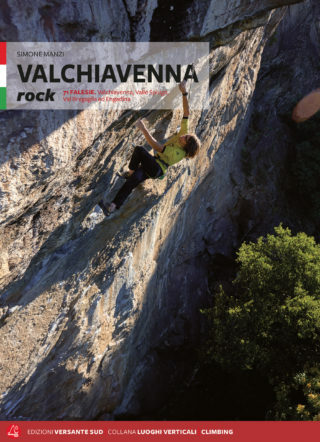 All the crags in the area stretching from Valchiavenna to Engadin: more than seventy spots for a guidebook covering a wide area, offering climbing proposals for any level and any season. After a hyatus in bolting new crags and sectors, during the last 15 years the whole area has experienced a renaissance. Many new routes have been equipped, and new walls have been bolted – both crags, such as Uschione, just over Chiavenna, which has seen a dramatic increase in the number of routes, and multipitches, both high in the upper walls of the valleys and in the valley floor, such as the wonderful and sunny Parete di Strem, in Val Bodengo, presenting historical routes equipped starting from the 2000s by dedicated climbers like Paolo Cogliati and Nicola Noè. The area features important historical and natural attractions; its location, along the Maloja and Spluga passes, vouch for excellent touristic facilities. Simone Manzi, born in Chiavenna in 1992, has been exploring his local mountains since childhood, thanks to his parents. At 19 he started climbing and skiing; in a couple of years he added ice climbing and ski-mountaineering to his activities. He’s a member of the Alpine Rescue Team managed by the Guardia di Finanza, and he’s attending the courses for becoming an Aspiring Alpine Guide. He climbed as well on the Dolomites and on Mt. Blanc, but he’s especially active in his homeground: he has explored the walls of Valchiavenna and Valmasino, finding a congenial style, shying away from crowded climbing spots and walls. He also opened new routes, and he’s busy in re-equipping and re-discovering historical routes.